Jim Cicchese has been a realtor in California since 1990 when he started his career at Fred Sands Realtor before moving onto Re/Max Olson and Associates. Currently, he works for COMPASS. When he’s not working, Jim Cicchese enjoys mountain biking, especially in the Santa Monica Mountains. 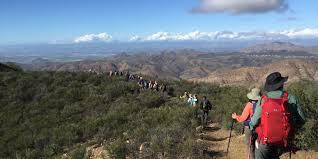 Close to Los Angeles, the Santa Monica Mountains are an amazing wilderness retreat with access to the Malibu beaches, as well as more than 500 miles of trails. The mountains offer many biking trails with a range of difficulty levels. One of the more popular trails is the Backbone Trail of Encinal Canyon, a great option for both beginners and experienced bikers. The trail runs 10.2 miles with a 1,777 foot ascent. The descent is one of the best parts, as it is smooth and relatively easy to ride. On the other hand, the Dead Cow/Suicide Loop is extremely technical and not recommended for beginners. Dead Cow is extremely steep and the Suicide Loop involves many single and double jumps, drops, boulders, loose rocks, and switchbacks.